Five years ago was one of the most exciting times in my life. I had just graduated from a tough undergrad program in wildlife biology at the University of Alaska Fairbanks, where I had gotten a bit of a rough start. My self-esteem was pretty much down the crapper when I entered the program, but as I got my feet under me I developed a passion for my degree—wildlife biology. When I launched into grad school I had an ambitious thesis research project: find a way to measure the amount of nutrients that herbivores are able to get from their food. 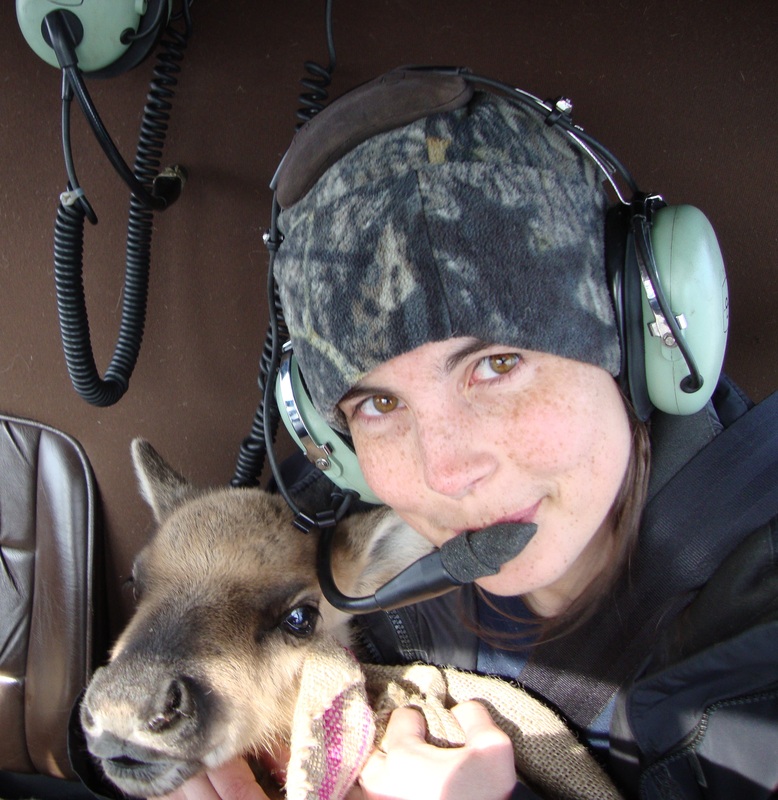 Then, take this method out into northern Alaska to see how plant nutrients affect migrating caribou in the face of resource development and climate change. It was a big project and I totally rocked it. People are still using the methods I developed to conduct wildlife research today. By the time I graduated, I was on top of the world, ready to tackle whatever pressing wildlife problems needed solving. I could be the wildlife superwoman! After graduating I landed the only job I could find, at a biomedical research facility—as an animal caretaker (read: janitor). Instead of coming up with groundbreaking new models and methods to analyze wildlife populations in need, I found myself scrubbing floors, scraping crusted animal poop and being degraded by some of the hoity-toity biomedical researchers who thought I was too dumb to read because of my job title. At first I was frustrated. I didn’t go to grad school to scrub floors and put up with this s*** (literally). I actually had a similar position before I even finished my undergrad—I could have skipped both degrees entirely if this was the end game! Over time my frustration grew to anger. Had I been duped by society? Then anger grew to desperation as the months passed by with no hope of rescue in sight. Finally, I became deeply depressed to the point where I didn’t see a reason to get out of bed in the morning. It was then that I realized something had to change. Throughout this whole experience I made one crucial mistake: I had turned my degree into my identity. Thus, when I wasn’t doing the work of my degree, I lost my identity. I’ve worked hard to carve myself out of that hole, but it could have all been avoided if I didn’t make that one key mistake. I know of a lot of other people who aren’t as lucky as me and remain broke and bitter. Because I kicked such a$$ in grad school, I thought I’d have no problem finding a job after graduation. I knew the job market was tough, but I was a hard worker with stellar reviews. Not working in your degree field was for chumps; I was going to make it. I was so confident I’d get a job that I never considered a backup plan. Thus, each day I went to work as an animal caretaker seemed like rubbing my nose in my failure as a human. In reality, you always need to have backup plans and consider alternate possibilities. You could become disabled, be laid off, have to move, etc…—all through no fault of your own. You need to be prepared for the idea that you might not be able to work in your field. Why did you choose your degree? I mean really why—before you even knew your degree was a thing? Once you identify why you chose your degree out of all the other ones, you can focus on working toward that same area, without your degree. I chose wildlife biology because I love researching and learning new things that can help make the world a better place. Also, caribou (duh!). I realized then that there are still ways that I can learn stuff that’ll help the world. I eventually settled on blogging and freelance writing, because then I have free license to research the crap out of anything I want and make a difference in people’s lives! The degree was still fun and totally worth it, but I can accomplish my base objectives through other means. Your job prospects will always be subject to the whims of someone else regardless of the degree you have. So, I recommend people have some sort of other project outside of their work that brings meaning into their life. It could be a business, a blog, an all-engrossing hobby, or any number of things. This is the same idea behind diversifying your investments. You split up your money and invest in different things so that when one investment inevitably tanks, you don’t lose everything. For me, I made my blog and my freelance writing my two projects. I may have been scraping crap during the day, but at night I could still use my hard-won skills from grad school to make a ton of money, change people’s lives, and have clients who were grateful for the work I did. It wasn’t easy, but I’ve gotten over my mistake. I don’t associate my identity and self-worth in being a wildlife biologist anymore, although that’s still one of my goals. Strangely enough, the techniques I used above actually worked to help me get a job within my field! Thanks to the skills I developed as a freelance writer/blogger, I was able to get a job in the federal government in a similar field to wildlife biology. I’m happier now than ever before, and I like to think I’m happier now than if I had just gotten a job right off the bat as planned. Working in the wildlife field often means taking on non-permanent jobs that are often subject to the whims of the latest government administration (*clears throat*). I would have always been fretting about whether I would have a job in the future, but now that I’ve got a secondary skill set I’m more valuable to potential employers and more likely to stay continually employed regardless of whether there’s wildlife work or not. If I would have known this before I went down this whole road I could have saved myself years of pain and frustration—but at least I’m stronger now for having gone through it! Are you using your degree? Congrats for your transformation Lindsay. I am going through a similar identity crisis right now and your post encourages me that reinventing yourself is a necessary thing and I should go for it. Thank you and greetings for the caribous. That’s a weird transition right? I still look back and can’t believe I was a band director (flying to NYC right now to do a panel discussion for financial companies). Life is weird. Absolutely LOVED this article! Definitely a must read for every students in their last year at uni. Glad you liked it Stephanie – I agree! Thanks Stephanie! I wish I would have read this my last year too. Although I am a first year college student, I appreciated this article too. I’m studying physics and I love it. I’m nowhere near the top students though, therefore I don’t see myself working with really huge projects. Yet. This article, however, made me think that I should look for more opportunities to improve myself. Develop new skills and interests. It will help me find a job in the first place, and who knows, maybe even in my field that other’s arent qualified for due to the lack of their skills. Hahaha, this is awesome. And it’s something I think a lot of us struggle with, so bravo for putting it into words. I’m *sort of? * using my degree. I majored in Media Studies and Speech and I’m technically in marketing, but I’m basically doing a lot of paper-pushing in my current job. Not super exciting or what I expected, but it’s related-ish. I do have my blog, which is my passion project and outlet for my more creative marketing plans, so that’s good! Overall I don’t mind it that much. I know Mr. Picky Pincher does struggle, though. He studied a field that tanked during the Great Recession and couldn’t find work with his degree after he graduated. He’s now in a totally different field and I know he’s frustrated he can’t do what he loves for a living. Oy. Oh, that’s tough. There’s still jobs in my field (for now, kinda) but I couldn’t imagine being in whole industry that tanks. You guys will get through it though! Great post! The key point here, I think, is that it was the skills you learned rather than the specific expertise that has counted most. I got a BS in Geology, but I got a job in cartography. That lead me to managing people, and ultimately gaining two masters (Engineering, and Business Administration) and a Ph.D (Public Policy). The key is always learning and adapting to what is available in the market place where you want to live. Very wise words, Steve – I love that quote, thanks for that! And you’re right: it was the experience that counted rather than the specific expertise. I’m glad I got both! Congrats on finding the right path forward for you. I’ve actually changed career paths 2 maybe 3 x depending on how you measure it. I’ve actually been in roles completely unrelated to my degree for the majority of my 13 year career. Ironically I’m closer to my career in my job now then I have been since year 1. So I guess what I’m saying is you never know, you might even find yourself back there at some point down the road.